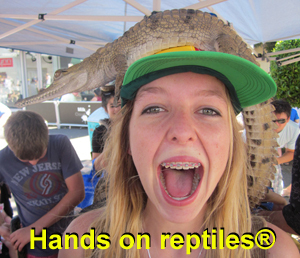 For other snake handling courses outside of Melbourne, Victoria, click here. 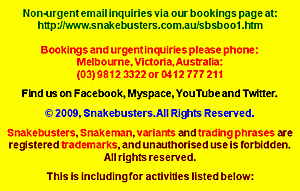 Snake handling courses in Melbourne, Victoria, Australia. Snakebusters are the only government licenced and accredited snake handling course providers in Victoria that are both nationally and internationally recognized. - Snakebusters are the only snake handling course in Melbourne and Victoria, taught by an internationally recognized venomous snake expert. Snakebusters/Raymond Hoser have provided training, teaching, educating and certification in relation to snakes and venomous snake handling to other (now) licenced snake handlers, scientists, TV personalities (including teaching the late Steve Irwin in the early 1990's ... yes we've been around a while! ), and others with a need to handle deadly snakes with safety. - Fully insured ($20 mil) and with all other relevant bits of legal paperwork, (Risk assessments, DSE permits, (JSA's if needed), written ethics committee approvals, etc), Snakebusters run courses at their state-of-the-art facility or alternatively at other venues including businesses, factories, mine sites, outdoors, interstate and even internationally. 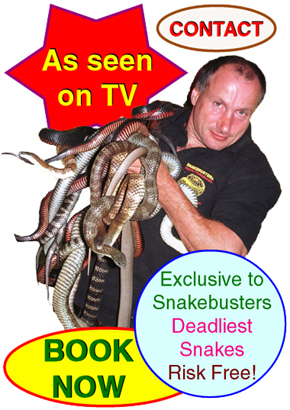 - Snakebusters/Raymond Hoser, has taught across Australia, the USA, Africa and elsewhere. - Snakebusters courses are the ONLY courses in Australia that satisfy the minimum international requirements that the teacher has at least 20 years verifiable experience handling venomous snakes and a minimum of 10 papers on venomous snakes published in peer-reviewed scientific journals. Without such recognition, any certificate issued by a course provider simply won't be recognized by many institutions, including reptile parks, venom supply facilities, wildlife rescue organisations, zoos and the like, regardless of claims made by the course provider. - Snakebusters courses are taught by Australia's Snakeman TM, Raymond Hoser, author of nine definitive books, hundreds of definitive papers (over 20 in peer reviewed journals), including all the major papers on the world's deadliest species and over 30 years at the leading edge of Australian snake science. - Snakebusters snake handling courses are alone in Australia in that graduates, receive the most highly recognized certificate of completion, and HWC CD-rom including nine definitive books, hundreds of papers and other essential reference material. A number of fly-by-night novices have registered business names in the period 2005 and later, started doing "snake handling courses", "snake control courses", venomous snake control courses", "reptile and venomous snake control", "Advanced reptile keeping courses" and so on, and make false claims about experience (they do not have), (often irrelevant) accreditation and the like and worse still commonly teaching unsafe and illegal methods of handling snakes, such as using "killer tongs". If your potential teacher can't even tell the truth about their expertise (or lack of it), what other misinformation are they likely to give during their course. Before commencing any courses anywhere, insist on independently verifiable proof of expertise beyond the international benchmark minimums of 20 years and over 10 peer reviewed published papers. If no such evidence is provided by a potential course provider on request, you can guarantee it doesn't exist! Put it this way, if a potential employer can't find proof of expertise in a reptile awareness training teacher, they simply won't believe unsubstantiated claims of expertise. This is especially the case in terms of venomous snakes (an industry of small size), when all the main players know one another and exactly who has expertise and who doesn't! Don't take risks with venomous snakes and venomous snake handling courses. Insist on Snakebusters and their verifiable decades of world-leading expertise. Insist on Snakebusters if you need to learn how to handle venomous snakes, snake safety and the like using methods that won't kill either the snake or yourself! Snake catching courses for individuals in Victoria (Course details, booking info, etc). Snake catching courses for groups (Victoria), and businesses, interstate (non Victorian) bookings, overseas, etc (Course details, booking info, etc).